Hopefully by now, you’ve gotten acquainted with the design elements introduced in Part I: The Elements. Now that you know what your building blocks are, let’s talk about how to assemble them! Design principles are a set of guidelines and considerations for laying out elements. These principles can be applied to guide users, improve usability, and increase appeal. 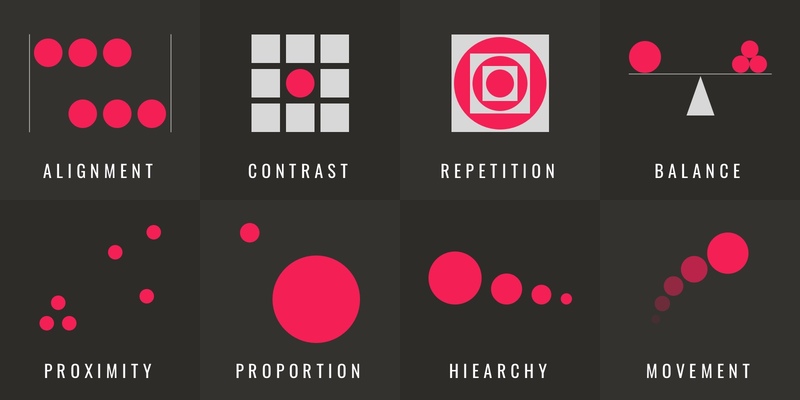 Hone your visual design skills by paying attention to good and bad design and considering which principles were employed to make or break it. Alignment is used to organize elements and create order. It is also what makes text readable. Contrast is the juxtaposition of elements. Differences can be used for emphasis or to create visual interest. Elements can be tied together through repetition. Repetition also creates associations and consistently. Balance is the distribution of elements. It can be used to create both harmony or tension. Proximity is used to create groups and organization. It visually shows the relationship between elements. Proportion is the relative size of objects. This can also be used to show the importance and relationship between elements. Hierarchy is the way elements are arranged to indicate importance. It can be used to visually guide the viewer towards focal points. Movement is the how a viewer’s eye moves along the visual. It creates flow and communicates the narrative. Be sure to read Part I: The Elements – where we introduce different the different building blocks used to create a design.